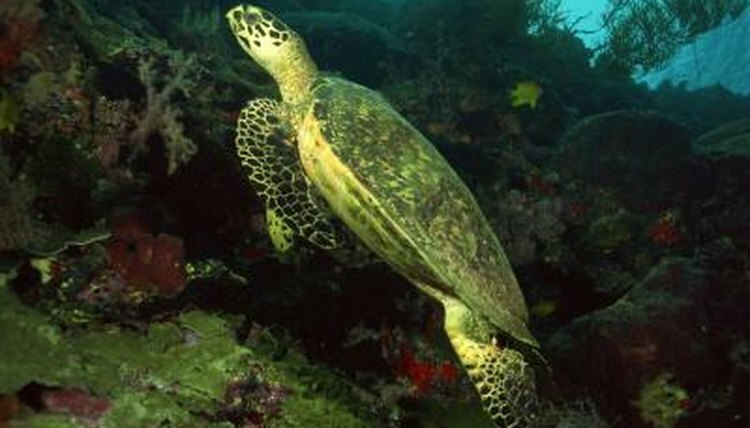 There are many different types of turtles -- some are freshwater species, while others live in the ocean. One thing they all have in common is that they lay eggs on land. Female turtles lay their eggs in nesting burrows and cover them up with sand, dirt or mud, then leave them to incubate. Incubation times vary, but average around two months before hatching occurs. After laying her eggs the mother turtle's work is done, so young turtles must survive on their own. Turtle hatchlings use a temporary egg tooth called a caruncle to break open the leathery shell of the egg. Just getting free from the shell can take 20 minutes or longer. According to 2011 research from the University of Western Sydney, certain freshwater turtle species can communicate with other embryos in a nest to let them know they are close to hatching. Less advanced embryos then increase their development rate so they can hatch around the same time. Turtle hatchlings can take three to seven days to dig their way to the surface. They are born with an embryonic egg sac which provides them with nutrition for those first few days until they are free of the nest and can find food. They normally wait until night to emerge from the nest to avoid many predators, and will leave in groups. Normally they head for water straight away in a mad scramble. Box turtles will head for leaf litter. Once freshwater hatchlings reach the water they will feed on water plants, algae and small water creatures including insects, fish and crustaceans. They are preyed on by snakes, rodents and other creatures until their shells harden and they grow enough to be unattractive to predators because of the big hard shell. Most spend lots of time on rocks and logs basking in the sun. Many species hibernate in winter, and young painted turtles will often return to their birth nest over winter. When sea turtles leave the nest they make a frenzied rush to the ocean. This is a perilous journey as many predators await them, including sea birds. Only one in 1,000 will likely reach maturity, Australian Geographic reports. As they rush to the ocean they imprint the orientation of the Earth's magnetic field, so females can return in around 30 years to lay eggs on the beach where they were born. Bright lights near beaches can disorient them and they may head the wrong way. Hatchlings that make it out to sea spend time in floating seaweed where they are camouflaged and can find food.